MARTYN MOXON was frustrated by Yorkshire’s group stage exit from the NatWest T20 Blast last week, but he has heaped praise on record-breaking opener Adam Lyth and off-spinner Azeem Rafiq. Lyth gave Yorkshire a chance of qualification with a brilliant 161 in Thursday’s final North Group win over champions Northamptonshire at Headingley, another county who missed out on the quarter-finals. 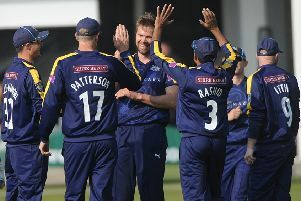 The left-hander underpinned the Vikings’ 260-4, with both totals being English records in T20 cricket. They only just missed out on being world records by a whisker, with Rafiq then taking a career best 5-19. “It was just an extraordinary innings,” said director of cricket Moxon of Lyth’s knock. “How do you describe it other than unbelievable? I’m delighted for him because he works so hard, and it was a very special night for him. He took it to a different level. “The beauty was that he played smartly, he had a variety of shots, they were unable to bowl at him, and I was very privileged to see it. I’ve talked before about a method, players finding their own method. It’s taken Lythy a little while to trust his method and his way of playing. But, wow, has he found it now? Lyth, 29, has not always been a regular in Yorkshire’s limited overs teams, particularly in T20 cricket. When he was playing Test cricket for England in 2015, he returned for county action briefly and was left out of Yorkshire’s Blast team. In last season’s Royal London one-day Cup, he scored two hundreds in two days, while this year he scored 304 runs with three 50s added to his 535 in T20. “Up until the last few years, Lythy has struggled in Twenty20,” said Moxon. Rafiq finished as Yorkshire’s joint leading Blast wicket-taker with 17 alongside Tim Bresnan. “Rafa’s performed pretty much every game,” said Moxon. “Bowling in T20 cricket these days is a tough ask. Your margins are so small. Yorkshire missed out on qualification by finishing fifth in the North with six wins, five defeats, a tie and two no results. They posted four scores above 220, while their net run-rate of 1.127 was more than double that of the next best team in either group. All five of Yorkshire’s defeats saw last-over finishes, including two off the last ball, at Derbyshire and Durham. Peter Handscomb, Yorkshire’s overseas player for the first half of the season, has been named as Victoria’s new captain back home in Australia. Billy Root, 25, brother of Yorkshire’s England captain Joe, has signed his first full professional contract with Nottinghamshire. Luke Fletcher has also signed a new two-year contract at Trent Bridge. He has been forced to miss the remainder of this summer after being hit on the head by a straight-drive back at him in his follow-through while bowling against Birmingham Bears in the T20 Blast early last month.